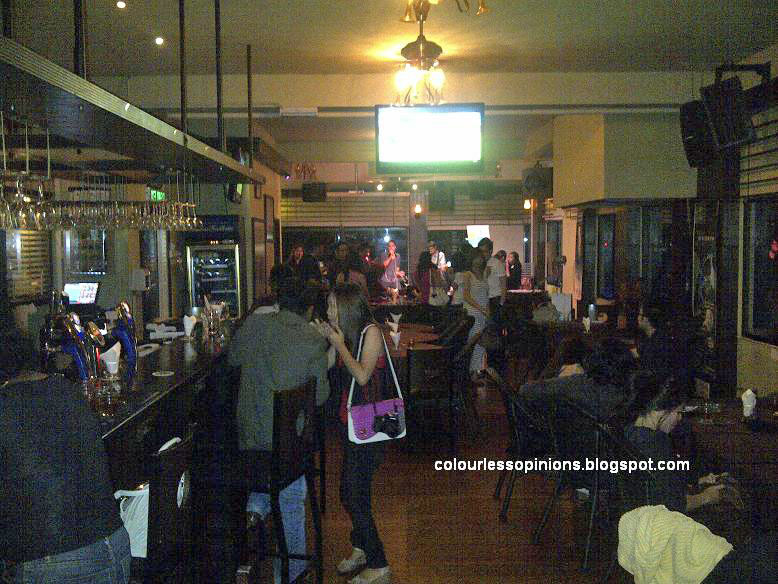 This was held on the 15th of July at Mark’s Place in Plaza Kelana Jaya. It was the first ever “Churp Out” session by none other than ChurpChurp. The purpose was obviously to create awareness for the bar restaurant and the social sharing company through social media of the invited guests, or “Churpers”. The emcee/host of the event was local band Rosevelt’s vocalist. Sorry I still don’t know his name. 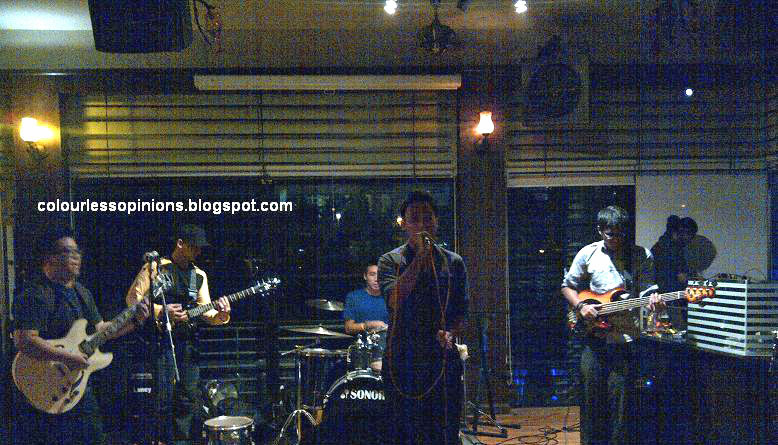 Rosevelt opened for Incubus’ concert in KL later that month. Due to the rain and inevitable Friday evening traffic congestion, the kick off of the event was delayed for about an hour to wait for the other Churpers to arrive. And because of that, the event didn’t start out as initially planned. 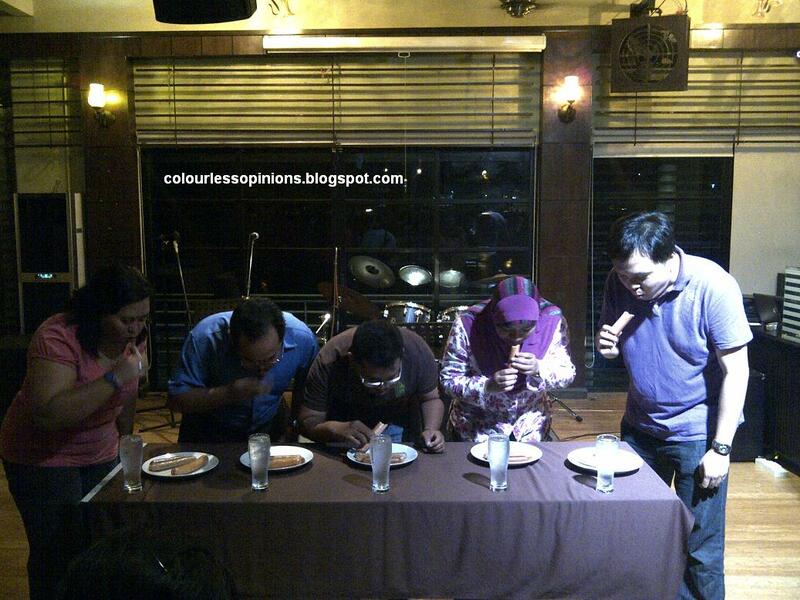 There was supposed to be an ice-breaking activity but they went straight into the sausage-eating game instead. Kudos for the 5 who participated ’cause it’s a rather embarrassing contest. After the little activity, it was already around 9pm and the Churpers were all hungry. 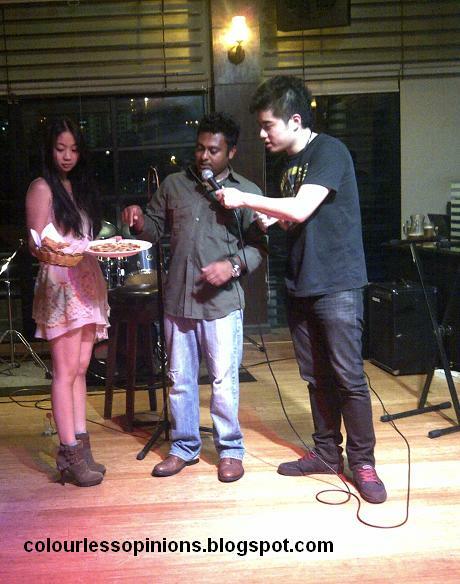 The owner of the bar restaurant, Mark, came out and introduced the “home-cooked” buffet that was going to be served. The buffet was halal. 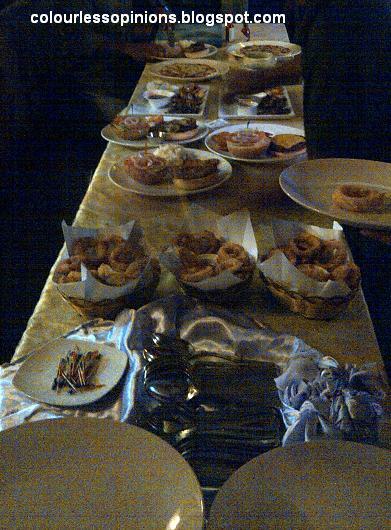 Besides sausage, there were pizzas, grilled chicken and beef, onion rings, wedges, prawns, hamburgers and many more. Out of all the events or food-tasting sessions I attended in July, the stuffs here tasted the best. The foods weren’t spectacular and I don’t know how much they’re priced but I’d rather pay to dine here than any of the other places I went to that month. 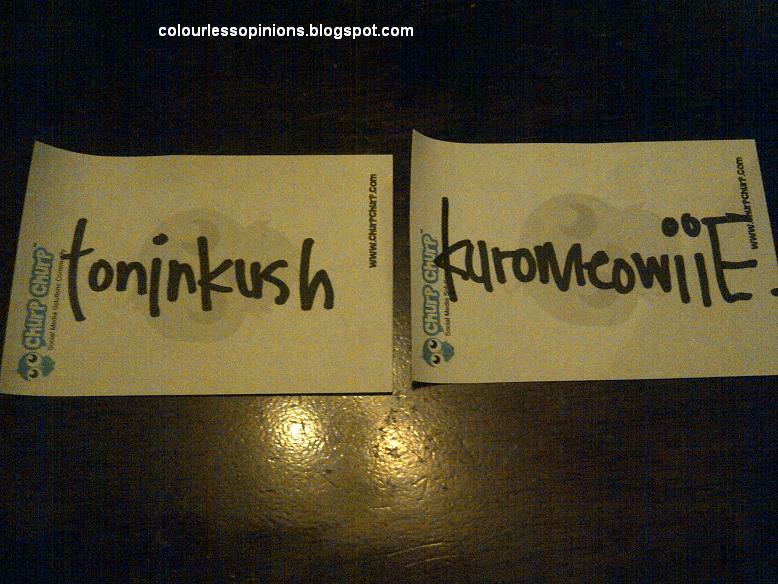 The following is an image of the name tag stickers for me and Iris but they weren’t used in the end. I assumed that it was because the ice-breaking game was skipped to compensate the time lost. The dancing game was next. Churpers were supposed to find their partners following the numbers that were given. The rules were no hand signaling and no word besides “Churp” was allowed to be said. The first 8 that found their partners got to participate in the dancing game. Every pair had to take turns to dance to the music and in the end, the winners were Iris and Shiok Leng as they received the loudest cheers from the crowd. How typical. 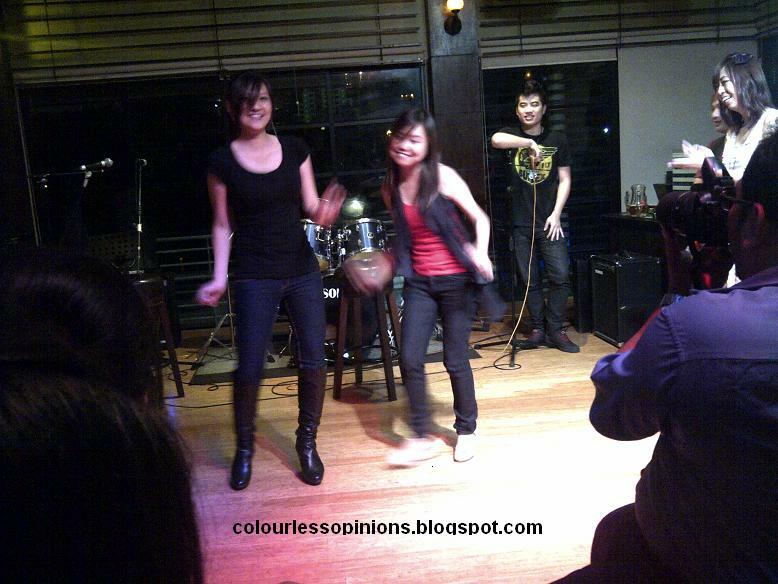 The rushy night ended with the music performance by a multi-racial rock band. The bassist and drummer were tight but guitarists were significantly horrible. One of the guitars didn’t even sound in tune the whole time. Mark’s Place should really consider hiring better musicians to play there.